When I first heard Surge was coming back, I kinda lost it. Now, I'm still losing it -- but mostly because drinking Surge will induce hyperactivity. We recently got our hands on two cans of the resurrected beverage, and subsequently decided we wouldn't be able to live with ourselves without assessing whether or not it still possessed that elusive "it" factor (this is a '90s drink, remember?). 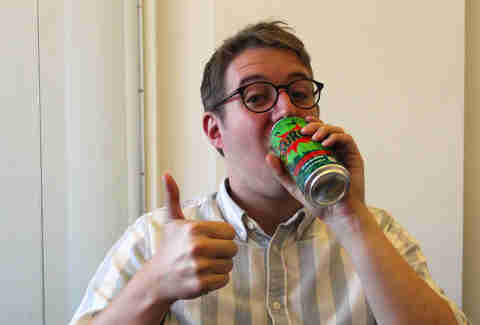 So, without further ado, here is your official Surge taste-test. Don't have a cow, man. 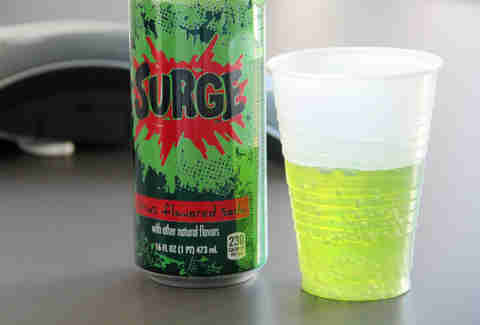 One thing that set Surge apart back in the day was its outrageous color, and I have to say that the beverage has aged well -- you can just make out the radioactive bluish-green glow, and draw some quick, easy comparisons to Nickelodeon's famous slime. The purest marriage of citrus and syrup. Faint hints of regret. Broad, sweeping overtones of extremeness. 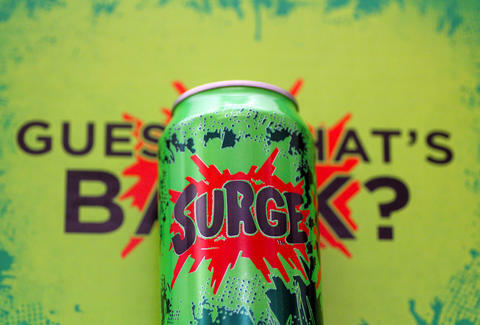 There's no disputing it: Surge is back, in a big way. It tastes like a citrus freeze-pop, except melted down and filled with an EXTREME! amount of bubbles. Now, I'm not sure if my 7-year-old self had quite as developed of a palate as present-day me does, but he was way into this stuff, and I can see why. Surge packs a whopping 56g of sugar per tallboy can. That's right. It comes in tallboys now. EXTREME! For those of you looking for a silver lining of health in this, you're in luck: one of the ingredients of Surge is "orange juice concentrate" (granted, it's the sixth ingredient down on the list, after "natural flavors", "citric acid", and "maltodextrin"). But for those of you just seeking the quickest sugar rush imaginable, it's definitely your golden greenish ticket. Twenty minutes after drinking it, I'm having trouble writing this sentence. And it's awesome. Mom and Dad -- I love you. Sorry for drinking all that Surge back in the day. If I make it, please send more Surge. Adam Lapetina is a food/drink staff writer at Thrillist, and can't feel his legs. Read his musings on Twitter at @adamlapetina.